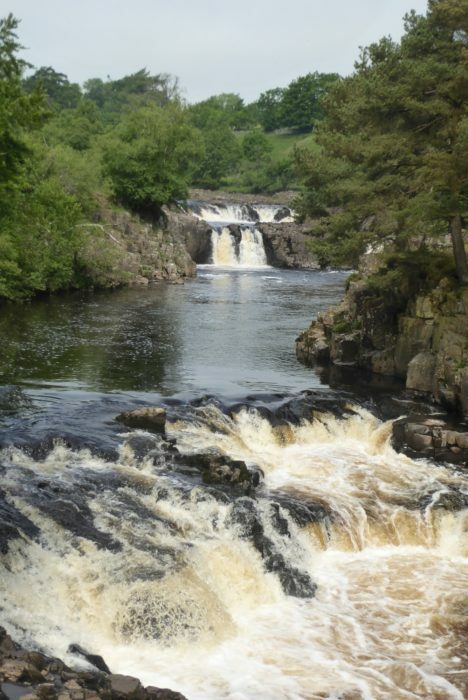 High Force on the beautiful River Tees (Day 4 - day 11 & 12 in the guide). 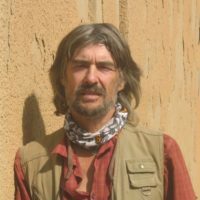 Once upon a time two 14-year-old boys ran back from climbing on the gritstone crags above their homes in Chew Valley in the Dark Peak to see a slide show by Tom Stephenson about the Pennine Way. It was autumn 1954, almost 20 years since Tom had written an article in the Daily Herald titled ‘Wanted: A Long Green Trail’. 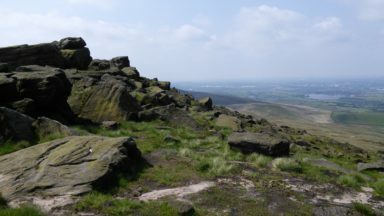 His actual motive was not simply to create a trail, but to open up the Pennine moorlands, which were still notoriously closed to the public by landowners. 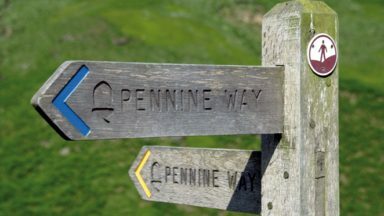 Another 11 years were to pass before the Pennine Way became a reality in 1965. 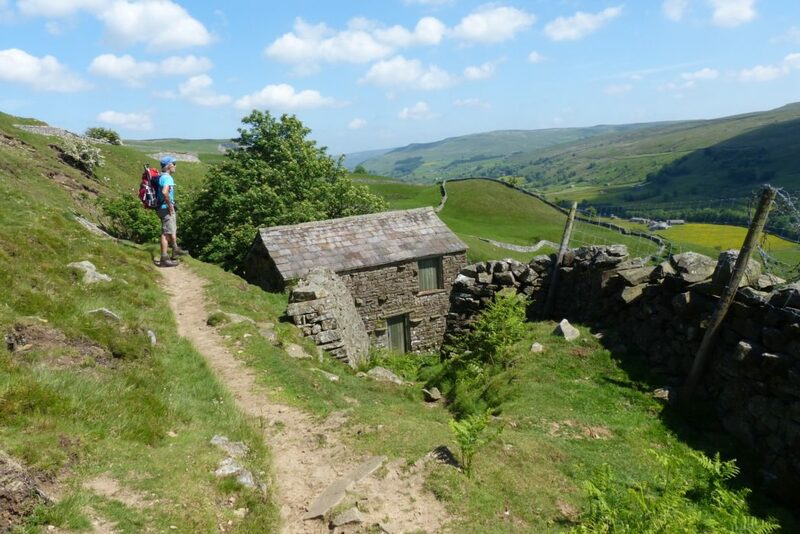 The two lads, me and Olly Whitehead, were so inspired by Tom’s talk that, although we were already obsessed with climbing, we thought it would be a great idea to walk the Pennine Way. After all, it crossed the moors above our village on its second day so it was on our doorstep. Then we had a change of plan as the thought of three weeks off rock was too much. 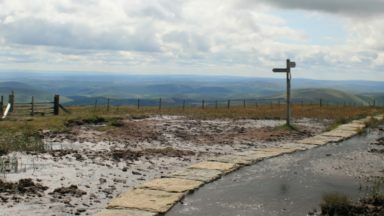 Instead, we decided to follow the Pennine Way to near Ingleton, then take the bus to Kendal and walk round the Lakes over the highest tops. 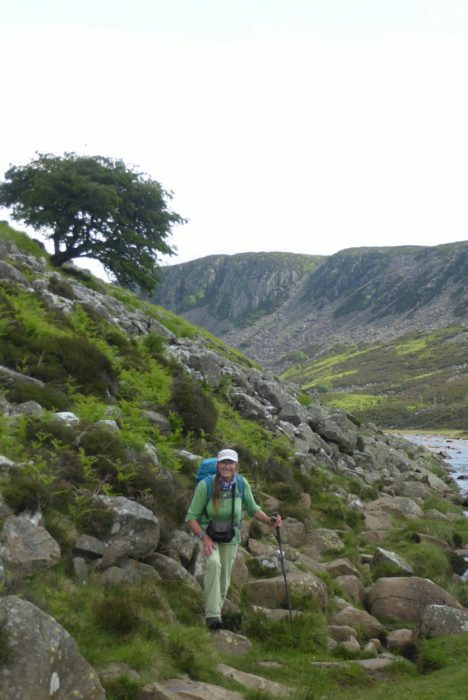 It would be a similar distance and take a similar length of time and be our first visit to the Lake District with all its climbs that we had read so much about. We set off the following summer aged just 15 and stayed in youth hostels along the way, although neither of us was officially an adult. 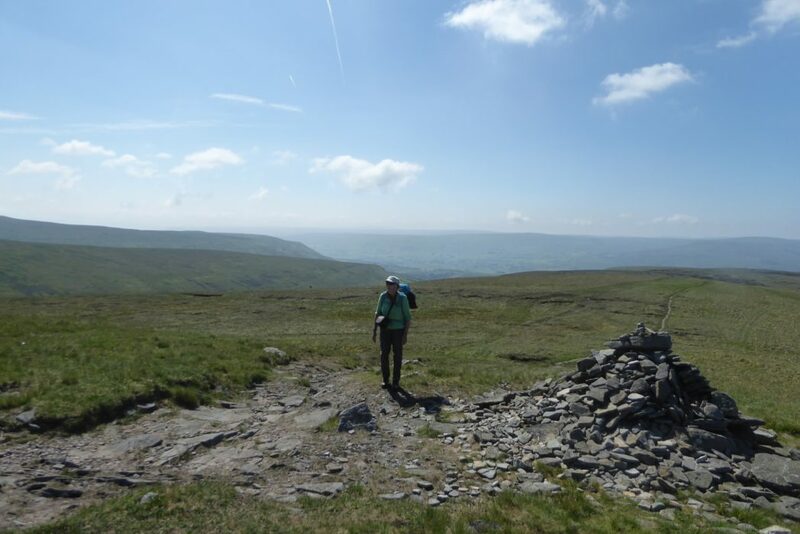 There were no signposts or waymarkers back then, no flagged paths, often no paths at all, not even a proper guidebook, but we made it to Ingleton and had a great walk round the Lakes. Despite dodgy weather on Gable, Scafell and Coniston’s Old Man, we learnt a lot and made plans to go climbing there. In fact, climbing and mountains have occupied the rest of my life. 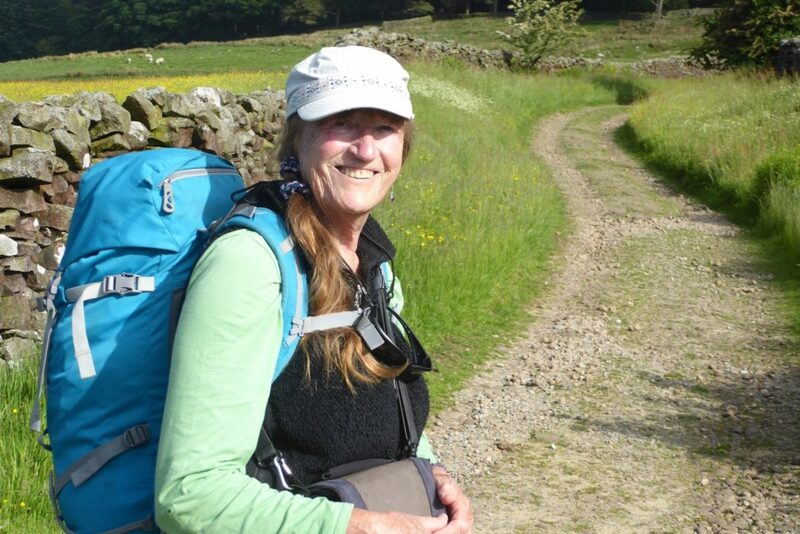 Sixty-three years later, in 2018, the weather was so good and the moors were so dry that on the spur of the moment I asked my wife and long-time climbing partner, Di Taylor, if she fancied a few days on the Pennine Way, picking up where I had left off. 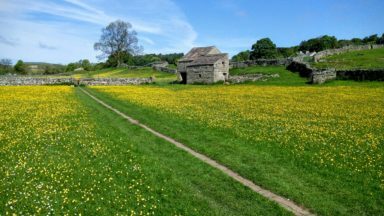 We had a blank week in our diary, why not go for a long overdue walk? We didn’t have a guidebook so we drove up to Cicerone Press in Kendal the next day, got a copy of Paddy Dillon’s The Pennine Way and maps and continued to the pub at Helwith Bridge, not far from Ingleton. The welcoming landlord allowed us to park there while we went off walking for five days. 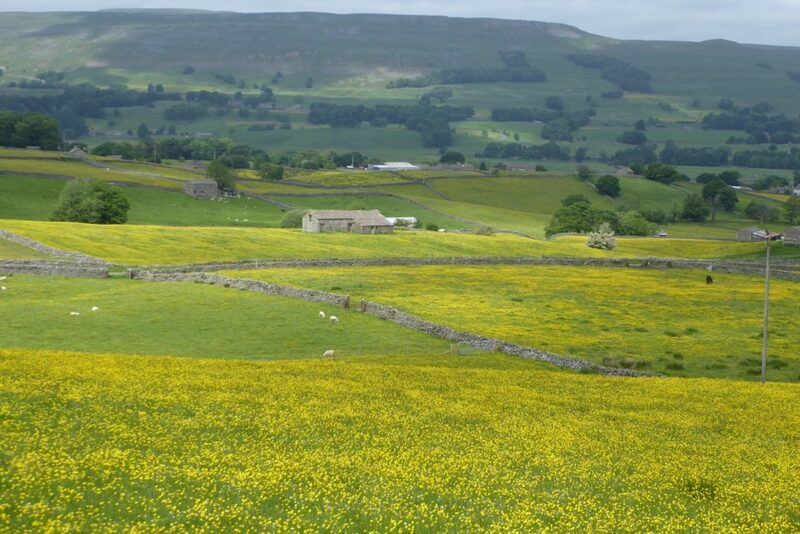 We started the next morning, sun in the sky and dew on the grass, which was speckled with flowers as we walked a couple of miles up the valley alongside the river to Horton-in-Ribblesdale where we joined the Pennine Way. With Paddy’s guidebook and maps, as well as signposts and waymarks, finding the way was usually easy, although one thick misty morning across a long meadow we briefly lost the trail and had to get the compass out just to be sure. 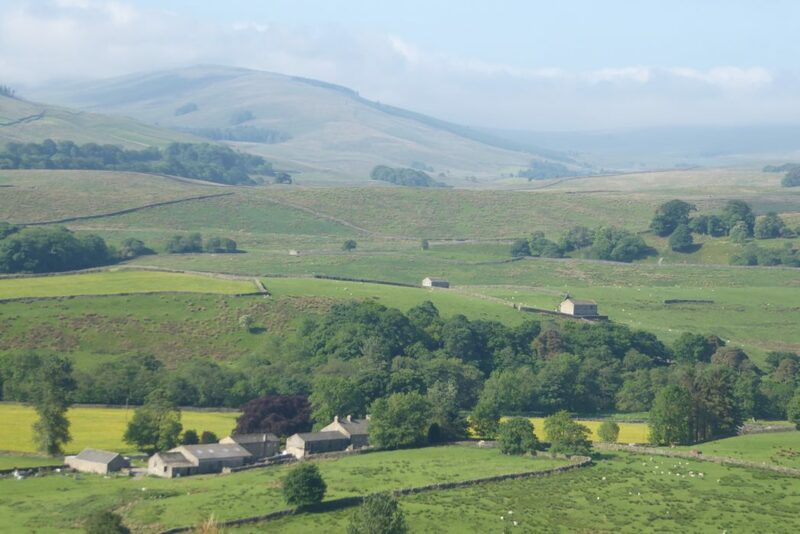 Most of the route from Horton to Dufton near Appleby passes over high moorland, usually on good tracks, and in June the air is filled with the calls of moorland birds such as curlews, oyster catchers, grouse and skylarks. We ended our first day at Hardraw, staying in the bunkhouse at The Green Dragon just half a mile from the Hardraw Force, which spouts impressively over overhangs into the valley below. If you want to see it, it’ll cost you £2.50. Such is life these days! 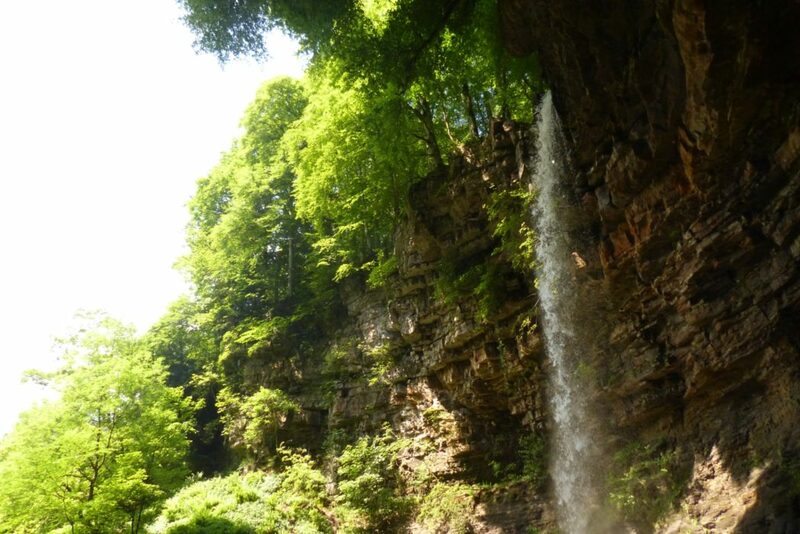 It’s reputedly the highest free-falling waterfall in England with a 100ft drop, but it didn’t look that high to me. Maybe I’m wrong. 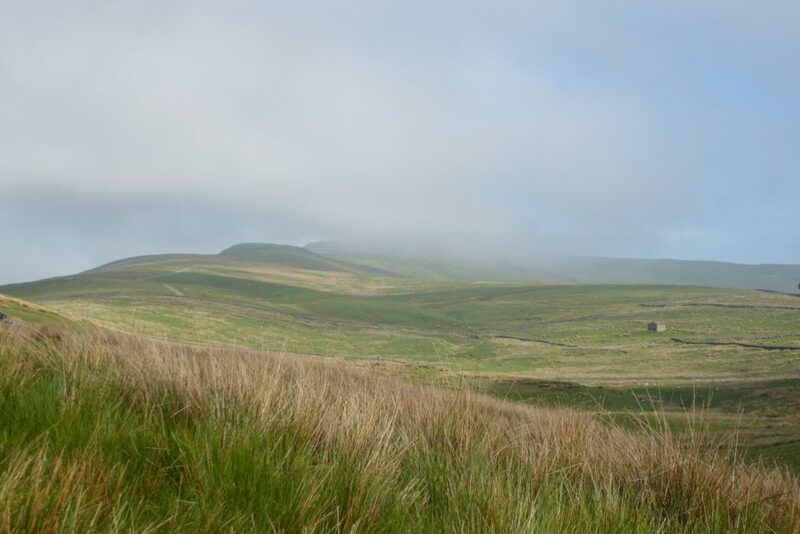 The next day we crossed the frequently cloud covered Great Shunner Fell, although we were treated to a wonderful day with extensive views to the far horizons beneath a blue sky with high drifting clouds. Pleasant enough to relax in the sun at the café in the hamlet of Thwaite. 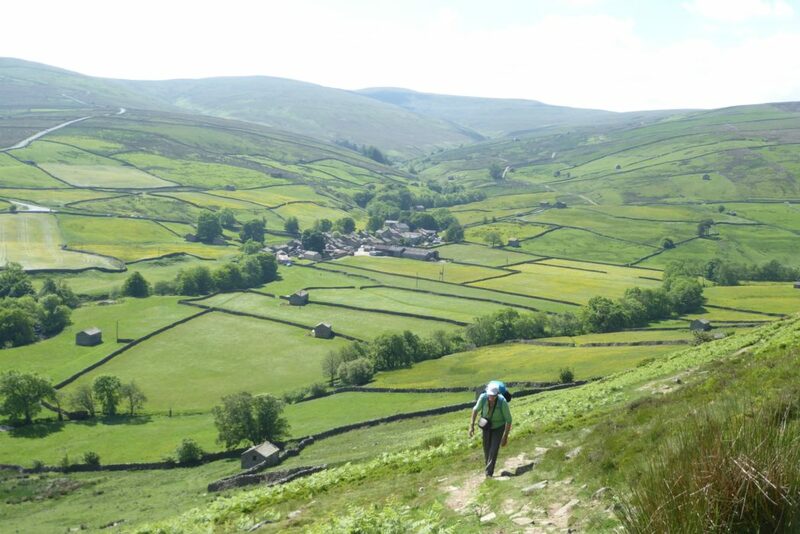 The last few miles, some of it unexpectedly rough going, then took us to the equally delightful hamlet of Keld where we were lucky to find a B&B. 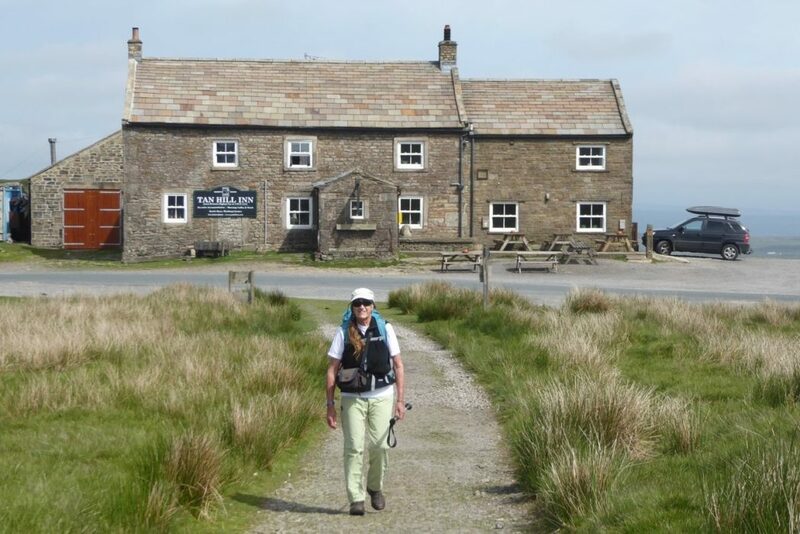 A steady climb back onto the moors heralded our third day, then an easy walk to Tan Hill Inn, Britain’s highest pub. Time for a mug of tea before setting off into the wilds of Sleightholme Moor, now with less obvious paths to follow until the increasing hum of heavy traffic on the A66 detracted from the pleasure of crossing God’s Bridge, a natural limestone arch over a stream. 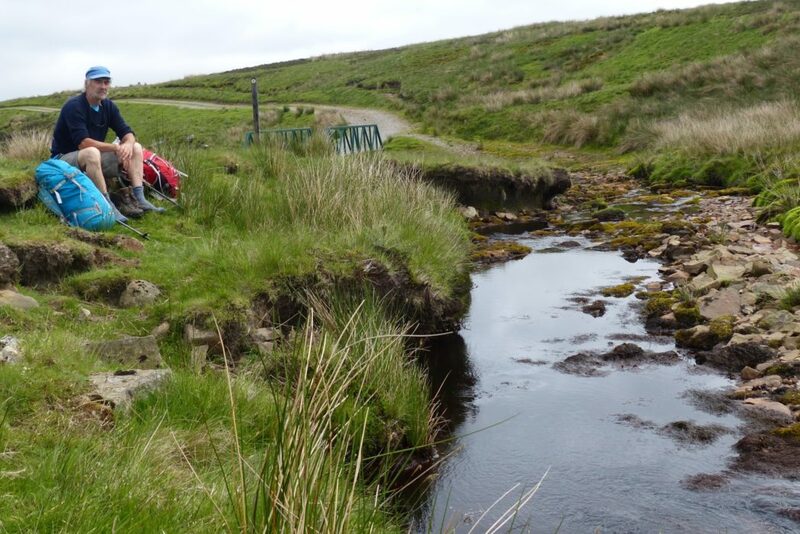 The route then goes through a tunnel beneath the road and onto open moorland again, the alien noise now rapidly receding. Beyond, with nowhere to stay in the immediate vicinity, a shelter offered a possible but unattractive overnight stop. 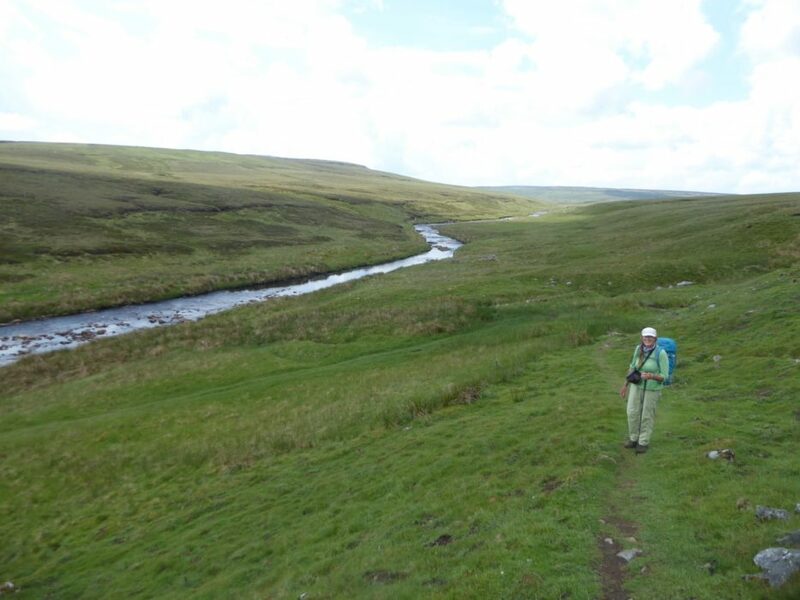 Paddy suggests some options but none are straightforward so we continued towards Middleton-in-Teesdale, which would be a 21-mile day, but why the rush? 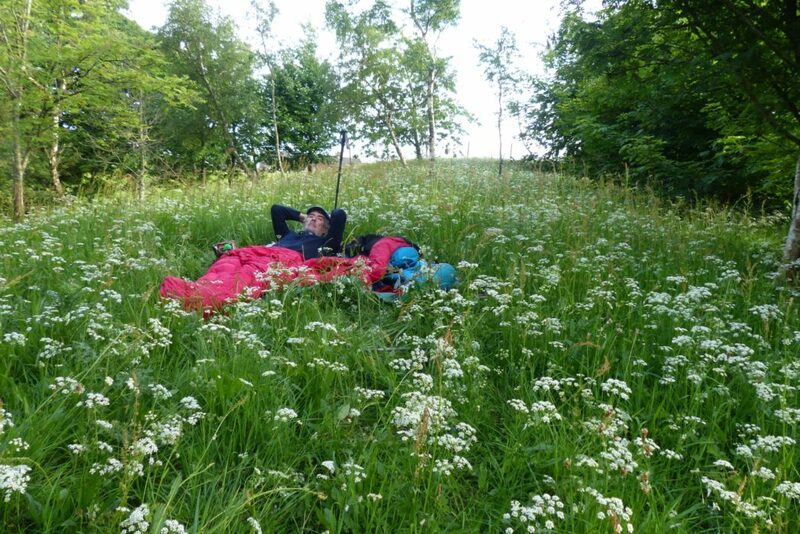 We had other plans, which worked out perfectly: the weather forecast for the week had been so good we hadn’t brought a tent, we simply ate a couple of biscuits and slept out on the flower-carpeted hillside. We woke at six the next morning to be greeted by a misty dawn before snacking on another biscuit and then walking leisurely over rolling meadows into town for a welcome breakfast. 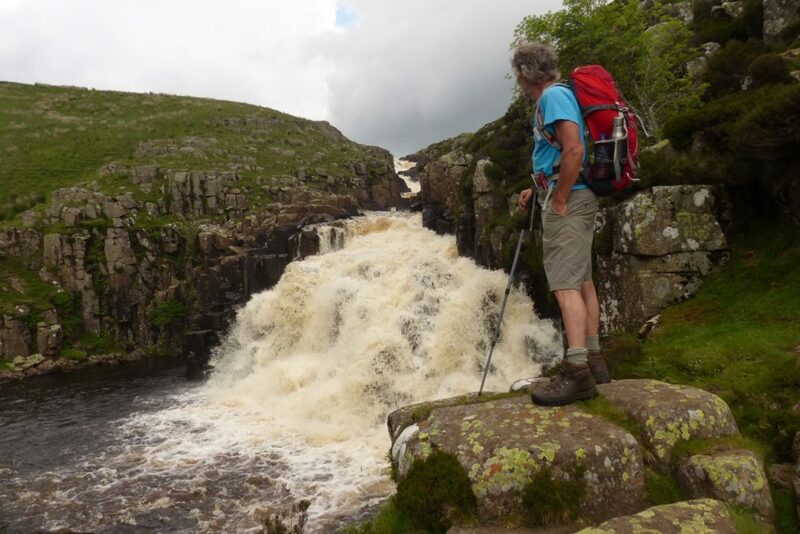 Replenished, we were soon off again, rising gently up alongside the idyllic River Tees and eventually passing the dramatic falls of Low and High Force before leaving the river for a night at nearby Langdon Beck Hotel. Another 13 miles done and another 13 left for the final day to Dufton. 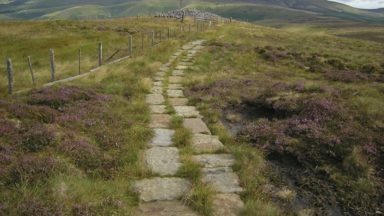 The Pennine Way follows the splendid valley of the Tees all the way up onto the solitude of the moors, with a good path rising gently alongside the river. Although we knew the dramatic falls of Cauldron Snout lay ahead, a roaring noise from beyond a cliff took us by surprise then, rounding the corner, there it was cascading down the rock. 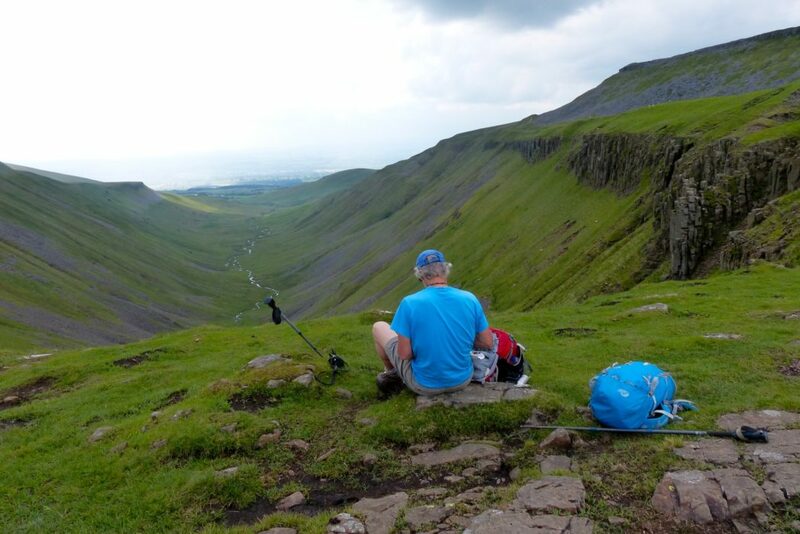 A nice scramble took us to its top, followed once again by easy walking across the wild moor, this time ready for the next surprise – the awesome gash of High Cup Nick. 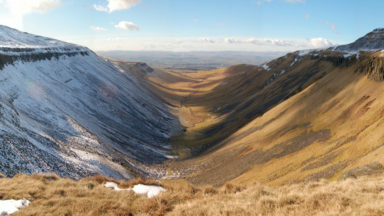 Rimmed by columns of Whin Sill, formed around 300 million years ago, the classic glaciated valley suddenly leads the eye dramatically down westwards to meadows and farms and beyond to the blue hazed hills of the Lake District. We stayed the night at the hostel, while visitors from the annual Appleby Horse Fair arrived at the nearby pub on their well-groomed horses. We were soon travelling again, but now by train. 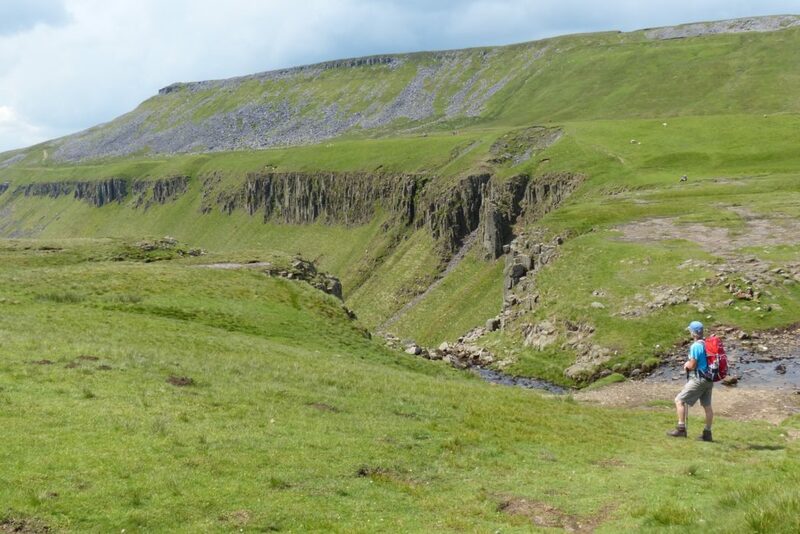 An hour later we were over the famous Ribblehead viaduct and back in Horton, leaving only the pretty 2-mile walk along the riverside to return to our van outside the pub at Helwith Bridge. The publican was also outside. “Good walk?” he asked. “One of the best,” I replied.